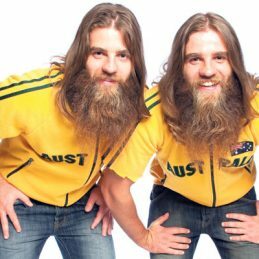 The twins big bush ranger beards and cracking one liner jokes are just a part of an amazing act never before seen on the comedy circuit. The boys are constantly bickering amongst themselves on stage and are never afraid to tackle a comment from an audience member. They have won several comedy awards in their career and shown their versatility by performing to sold out audiences in Edinburgh during the 2010 Fringe Festival. Connection – The importance of connecting with others, building new relationships and strengthening existing ones. The ‘Stand up and be Counted’ (SUABC) program offers something that has never been seen in secondary schools before. SUABC is a fun, educational and exciting program that gives students the opportunity to face one of life’s greatest fears, speaking in public. Engaging students with humour, The Nelson Twins take the kids on a journey of self-discovery and equips them with the skills to take risks and get out of their comfort zone. The one day course covers five types of comedy (story telling, one-liner’s, impersonation, slap stick and observational humour) as they work towards constructing there own stand-up comedy routines. Through a range of group activities and one-on-one tuition, students are guaranteed to be speaking confidently to an audience of their peers by the end of the session.